I've been working steadily on cards and pictures for this coming weekend's show. Today I worked on this little fabric landscape. Can you say French knots? totally handmade cards. I'll share pictures soon. after a hard battle with lung cancer. and school principal who made a big impact on her students and her community. 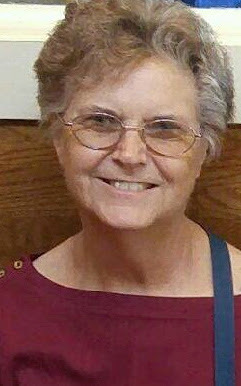 person she was and what a wonderful sense of humor she had. to see me and we had a lovely visit with her daughter and two of her grandchildren. touch with her over the years. I'm so glad that she found me again. these special relationships as anything less than the gifts they are. I wish that I could tell her how grateful I am that she found me again. Could it be day 27 of Art Every Day Month? I've been feeling long after it is over. to have copied and to use on holiday cards for our sale next weekend. and they were not very appealing. 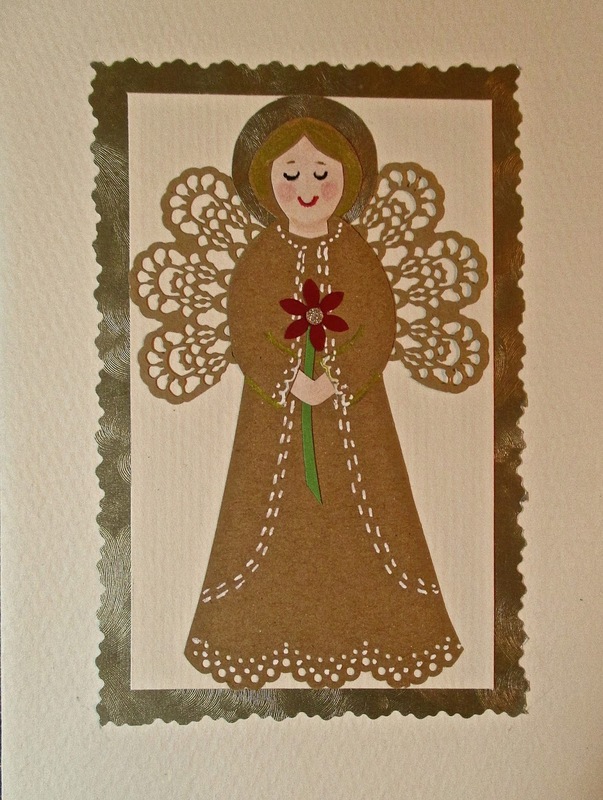 handmade cards, at a higher price. back to doing some different things. Meanwhile, I'm close to being done, so onward and upward!! and framed this floral still life. at next weekends exhibit and I'm losing patience with all the details of picture framing. and I'm planning to have fun with them! I'll be putting in a holiday show and sale next weekend. out to the porch every few minutes to check mat colors in daylight. Tonight I'm finishing some hand embroidery on them and will frame them in the morning. so I want to get these out of the way. 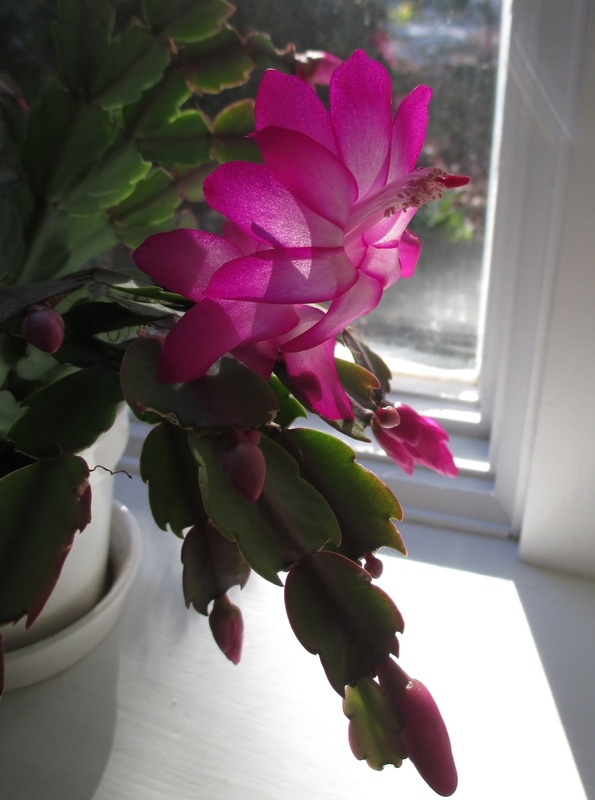 is blooming its little heart out! Well, I'm going for full transparency here on my blog today. I'm like a dog with a bone with this project! She is now transformed into an older angel with eyeliner! ha ha! I'm still working on her - hence the unfinished sign. 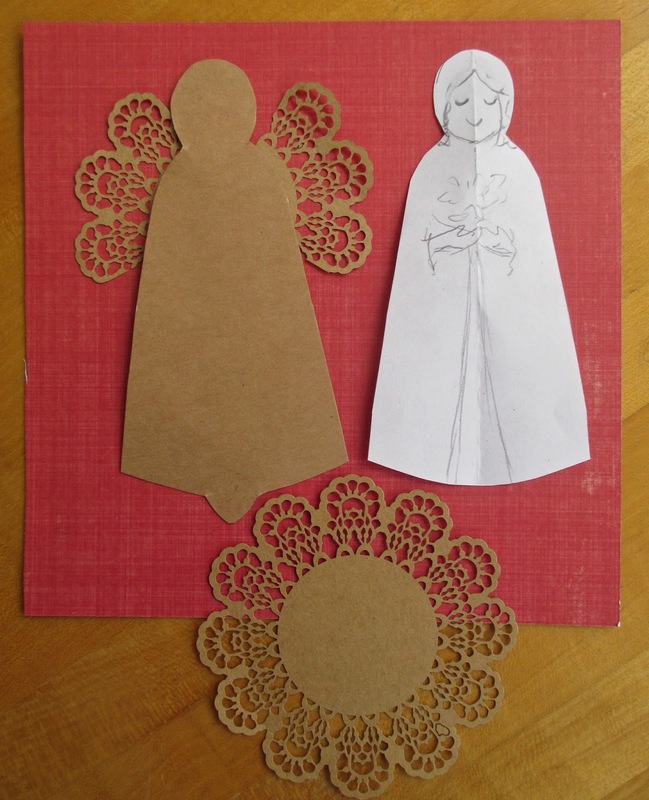 kraft paper doilies, none were to be found. and I'm wondering that also. Will I use them for cards? As ornaments? As little framed pictures? change those eyes, figure out the banner and call it quits! some things are just meant to be "good enough"
It was a beautiful Autumn day today and I spent a chunk of the afternoon out on my porch, working on a design for paper angel ornaments and cards. I enjoy doing this - I usually design whatever I make and don't work from patterns, but it can be tedious. No matter how carefully I plan, it's not until I finish the first prototype that I know how well the design worked. In this case, the first angel was not quite what I expected, and I can see some things I'll want to change. I won't say what they are, aside from the messiness of her collar, but I hope to share the new and improved Angie Angel in my next post!! 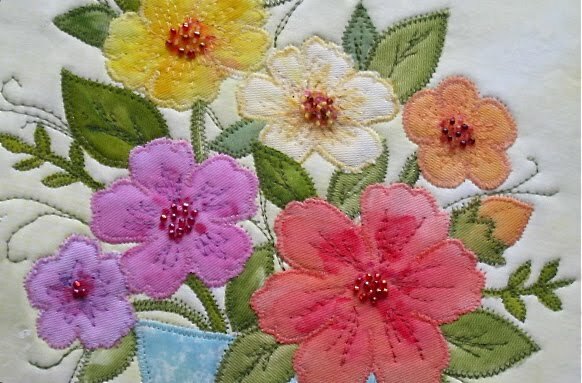 Today I went to my stitching group - wonderful friends who are working on all sorts of hand-stitched projects. I brought along this wool appliqué wall hanging which I had cut down and want to make into a pillow. I ripped out some border stitching to try to get as much width as possible. I'll decide tomorrow whether it is really worth being used as a pillow. 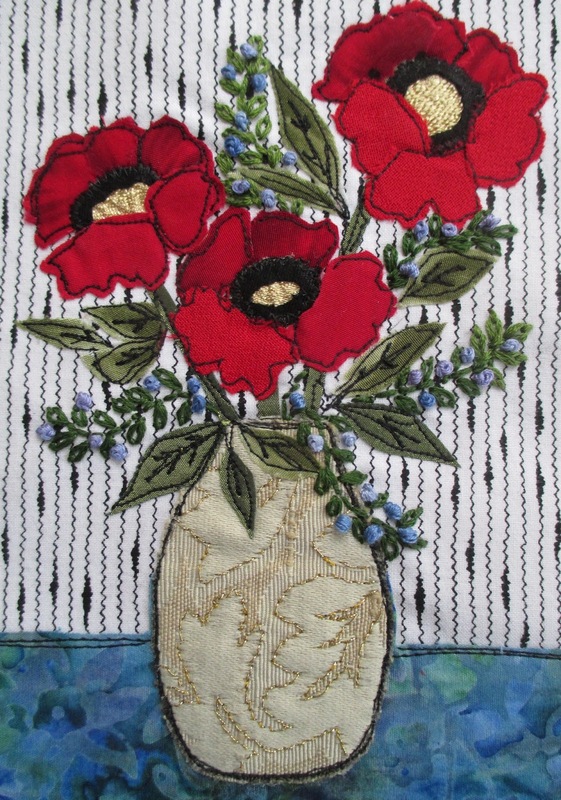 It is all hand stitched and would be something a bit different at my holiday fair table. I should probably keep it simple and just go for it! 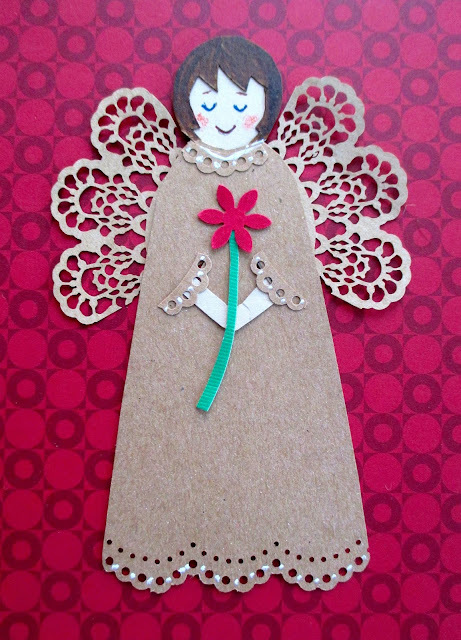 I also fiddled with my paper lace angel design from two days ago. She will show up here again in the next few days! Wishing everyone a wonderful Friday!! Today was a running around kind of day, but I stole a few minutes to finish my first entry in a new art journal. I always need a bit of cuteness or humor when I do a journal - otherwise it gets boring for me. Not a great photo, since I took it late in the afternoon by lamplight. Last night we had heavy rain and I had to drive my husband home from a medical appointment, along a route I'm not familiar with driving at night. Between the darkness and the downpour, I felt like Mr. Magoo, hunched over the steering wheel, trying to see the lines in the road. We laughed afterward, especially me, at myself! I was so intense - I'll have to do a cartoon of this sometime! Are we really halfway through November? Time seems to be flying by lately and I'm trying to get my house clean for the holidays. Unfortunately, I have a holiday sale coming up, so I'm trying to finish up a few things for that and I keep getting ideas for new items to make. Not such a bad thing, really! I've been wanting to make some angels and I came across these little brown cardstock doilies I had purchased a while ago - light bulb moment - wings!! Then I thought, paper angels would be so much easier than stitched ones! And thus, the cleaning was forgotten and the designing begun! Let's see - keep it simple, feet or no feet, white accents or colored, eyes open or closed, punched flowers or not, wearing a cape? etc, etc, etc… Lots of decisions, but this is what I love! And now I'm imagining them in wool with lace wings, or gingham, or…..
Back to housework for awhile, but there will be more creating tonight!! and also a drawing of our cats, Rosie and Angus. and I've tried to express that in their eyes. adding some color with watercolor pencils. and I'm just now finishing up this fabric landscape with some hand embroidery. I'm planning to add some color in the foreground and some birds in the sky. I love birds and have decided to add them to my work on a regular basis. especially late in the day when the setting sun sets it aglow. and I feel like it's such a gift. you are having a wonderful weekend! as well as to create some new ones. I added embroidered details and finished it up today - a great feeling! I was also so happy to see my Christmas cacti blooming today. They always remind me of my mom! Such a beautiful day here in New England. Having voted early, I was free to spend some time on the porch in the afternoon sun. With days shortened by the recent time change, I feel like I'm chasing daylight lately, the sun begins to slip away so early. 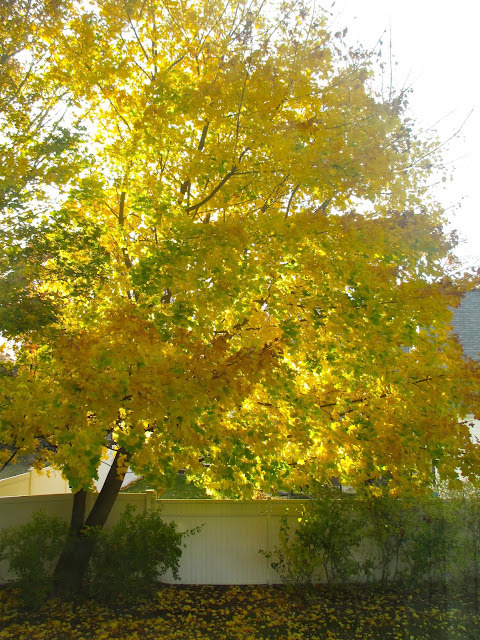 The trees behind the house are glowing with autumn golds and greens and the colors shimmer outside the porch windows. When I'm working on something, I always seem to create a mess! as far as I got today. 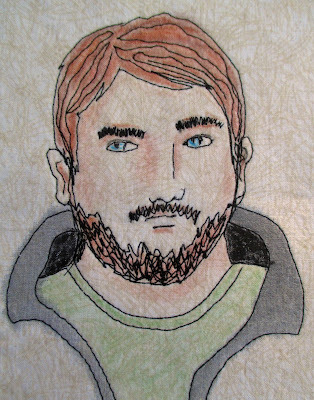 Now that I've chosen colors in daylight I can work on embroidering tonight. praying that the "right" decision will be made. and loved how it looked against the trees in my yard! I'll reveal it tomorrow, I hope! and thought of the perfect caption for it, in view of what's going on in our country lately! "George has voted early and does not want to hear another word about politics!" of an unexpectedly mischievous sense of humor. or even a tiny token of love. Tomorrow I will add some color, embroidered details and a little story. But what will I name her? Still at it - so far so good! Today I worked on 2 things, but I'll save one to show another day. 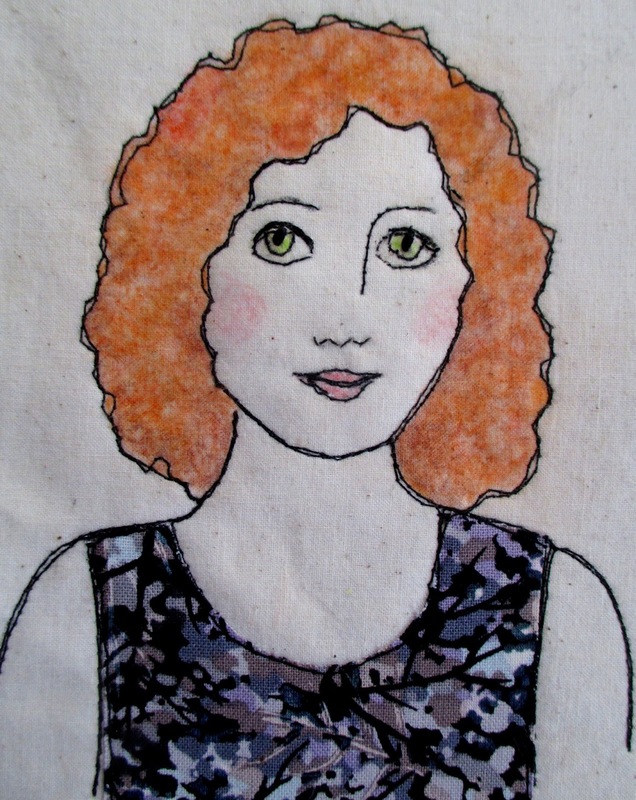 I started another stitched portrait on the sewing machine. This lady will be named after I complete her - I have to see how her personality develops. I usually touch up the facial features with hand embroidery, and I'll add some color. For today, a small snipped and fused fabric landscape. I will use this for a card design. Hope you're enjoying a very good day! 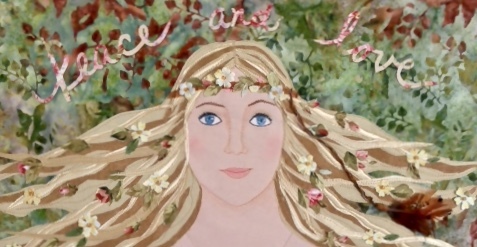 Well, I'm doing it again - jumping into Leah Piken Kolidas' Art Every Day Month November challenge. I've done it a few times before and I wonder, what is it that motivates me to do this at such a busy time of year. I don't know, there's an excitement to it and it gets me moving creatively. I can promise you, I will skip days, but let's see how I do! always generous to a fault, quick to recognize an injustice." Thanks for visiting - hope you have a great day!